Rev up your metabolism with Nature’s Sunshine Ultra Therm. 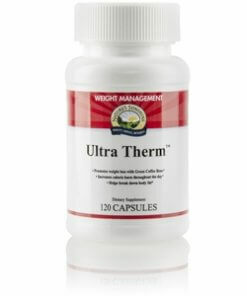 Ultra Therm features a powerful combination of green coffee bean extract, green tea, and a sustained-release energy blend. This thermogenic formula increases calorie burn while helping your body break down fat. 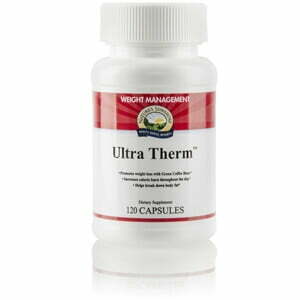 Boost your metabolism and start achieving your weight management goals with Ultra Therm today. Instructions: For the first three days, take 1 capsule at breakfast and 1 capsule at lunch, then increase to 2 capsules at breakfast and 2 capsules at lunch. Each bottle contains a 30-day supply. Green coffee bean extract—chlorogenic acid (CGA), thought to be the active ingredient in safe, caffeine-free green coffee bean extract (Coffea canephora), may help block sugar absorption, promoting satiety and healthy blood sugar levels already in the normal range. In initial studies, taking green coffee bean extract has resulted in weight loss, much of it fat, in overweight individuals. Green tea leaf extract—drinking polyphenol-rich green tea (Camellia sinensis) has been linked to good health for centuries. Beyond already documented benefits for cardiovascular health, brain health and healthy aging, the extract’s active components—including polyphenols such as epigallocatechin gallate (EGCG)—now show promise for weight loss. Researchers believe green tea may have a thermogenic (calorie- and fat-burning) effect, and also may inhibit fat absorption. Sustained-release energy blend—this blend of ingredients, including a patent-pending form of caffeine, provides safe, lasting energy support that may increase energy expenditure throughout the day, increasing calorie burn rate and supporting moderate weight loss over time. Ultra Therm contains 150 mg of caffeine per serving (slightly more than a cup of coffee). Capsule (gelatin, water), cellulose (plant fiber), magnesium stearate (vegetable).